Suggests ways to talk to your doctor about birth control and specific questions you should be asking. Includes a questionnaire that guides you to discovering your ideal birth control option by examining your health risks/factors. Offers a glossary with easy to understand definitions of birth control terminology about birth control that you want to better understand. Has pictures and movies/animations of available birth control options. A daily, customizable reminder message that can be sent via text or through email as well as reminders to take your placebo pills. Also features a snooze alert (that you can arrange), that stops once you have taken your contraception. Various contraception themes to choose from: there is a NuvaRing theme (to remind you when to insert and remove your NuvaRing) as well as color themes and a seasonal theme (for pills that reduce your periods to 4 times a year). Allows you to change your pack start date at any time. You can also customize how many active (hormone) pills are in your pack (good for extended cycle pills like Seasonique). There is a history section where you can write notes, record side effects, spotting and period dates. You can track your start date, missed pills, and time you took the pill each day. The myPill planner reminds you of when to purchase new pill packs, call the doctor, schedule yearly exams, and stores your prescription information. The app also shows you how many pills are left in your pack. A table that compares contraception efficacy rates for different contraception methods. 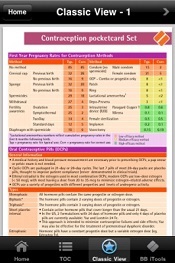 General prescribing information about types of birth control pills, their use and their safety. Contraception recommendations for special cases, such as which pill to prescribe for nursing mothers, for those at risk of blood clots, for women who have menorrhagia, or for those who want to regulate or reduce the frequency of their periods. The Contraception i-pocketcards birth control app provides you with fundamental information on most contraceptive methods and in-depth information on oral contraceptives. Contraception i-pocketcards could also benefit from the inclusion of material to assist doctors and women in choosing the method that may be the best fit for the patient. Tip: More up to date information can be found online in the Education Database »medicine & health«.